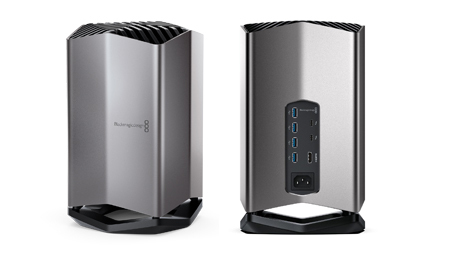 For higher end projects like video editing, virtual reality, and higher end video gaming, it was only a matter of time before Blackmagic Design got into the eGPU game with their own distinctive spin. Enter the aptly named Blackmagic eGPU. 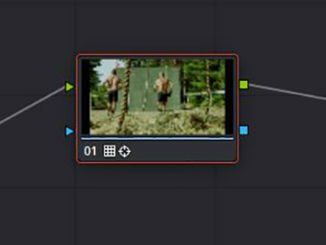 And while it’s designed to work with Apple, it seems to have Davinci Resolve’s Suite of powerhouse post production tools in mind. 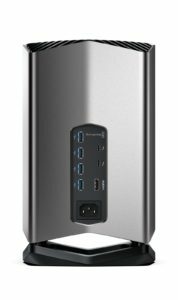 Looking at Blackmagic’s eGPU, it almost looks like a tower based desktop computer all itself. With the high performance workload of 8K video, virtual reality, and visual effects rendering, workstations need a beefy GPU to shoulder graphics processing, freeing up the computer’s GPU to do other things. The latest trend towards external GPUs makes total sense because doing that kind of high performance rendering can generate a lot of heat and require a ton of power. Designed in collaboration with Apple to work primarily with the MacBook Pro, the Blackmagic GPU features an AMD Radeon Pro 580 GPU to handle all the work, plus has a bevy of connectors including two Thunderbolt 3 ports, four USB 3.1 ports, HDMI 2.0, and an 85w power supply. The Radeon 580 graphics processor has 8GB of GDDR5 RAM, a 256 bit memory cache, and 36 discreet compute units for a whopping 5.5 teraflops of processing. 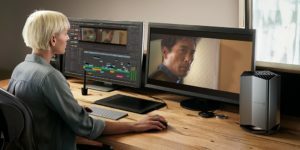 Blackmagic estimates that the card built into the eGPU can fill up to nearly 39 billion pixels per second, and Apple engineers worked with Blackmagic to boost every literal bit of power out of the MacBook Pro, and turn it into a desktop capable editing machine. 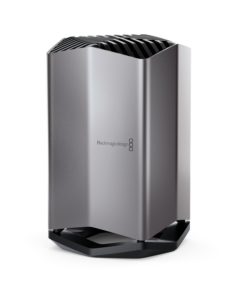 The Blackmagic eGPU is also designed to give DaVinci Resolve 15 users increased performance for editing, with real time effects that don’t require waiting for rendering. 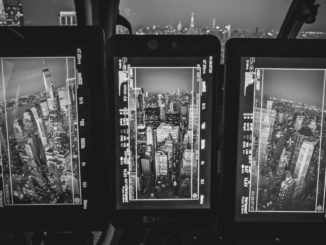 Color Correction benefits from more nodes, and Resolve FX gets more film grain options, light rays, blurs, and a host of other features that the eGPU will handle in the post production workflow. Blackmagic has also updated DaVinci to fully support Apple’s Metal architecture, which will work in near-direct access to the GPU for little latency in live effects or video gaming. Meanwhile, with all those ports, the Blackmagic eGPU can work as a docking hub for connecting multiple devices such as dual 5K monitors via Thunderbolt 3, external video connections, network attached storage, and other peripherals. iMac Pro users enjoy the higher end VEGA cards, so they won’t get as much of a boost from it. 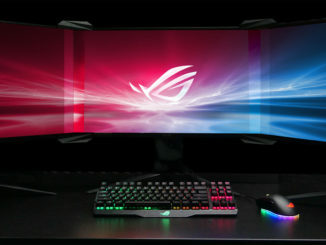 Neither will higher end 27″ iMacs, since the Radeon 580 is available in those models. So why spend an extra $700 for the status quo? I would have thought, considering the state of the art, that a more powerful GPU would have made the cut. Bitcoin miners may like it though. LOL. Additionally, it looks like the Blackmagic eGPU isn’t designed to be upgradable, which is typical for an Apple centric product. But if you can’t add your own upgraded cards down the line, your eGPU is going to be obsolete in a year or two, maybe even less. And at $699 a shot, that’s not cricket. Available now exclusively from the Apple store and selected Apple retail outlets worldwide.